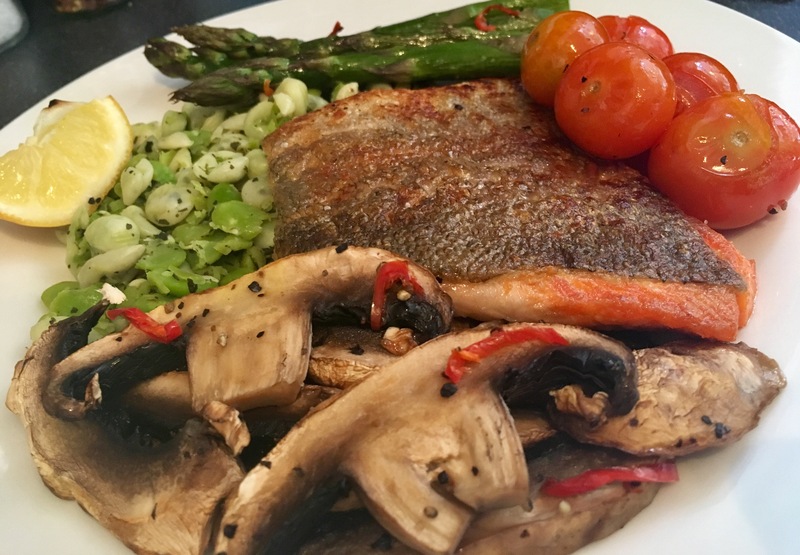 Despite the depressing grey skies and relentless rain, looking back through my recent blogs I’ve been reminded of a fishy dish that’s perfect for the season. 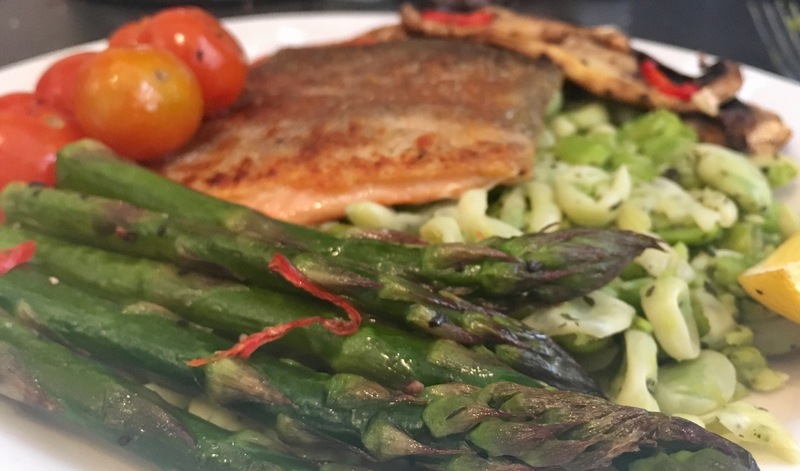 Following on from the fabulous spring menu tasting session I was kindly invited to at Malmaison a few weeks ago (you can read all about that here), this evening I decided to adapt the fabulous trout dish I was lucky enough to try in the private dining room of Chez Mal. 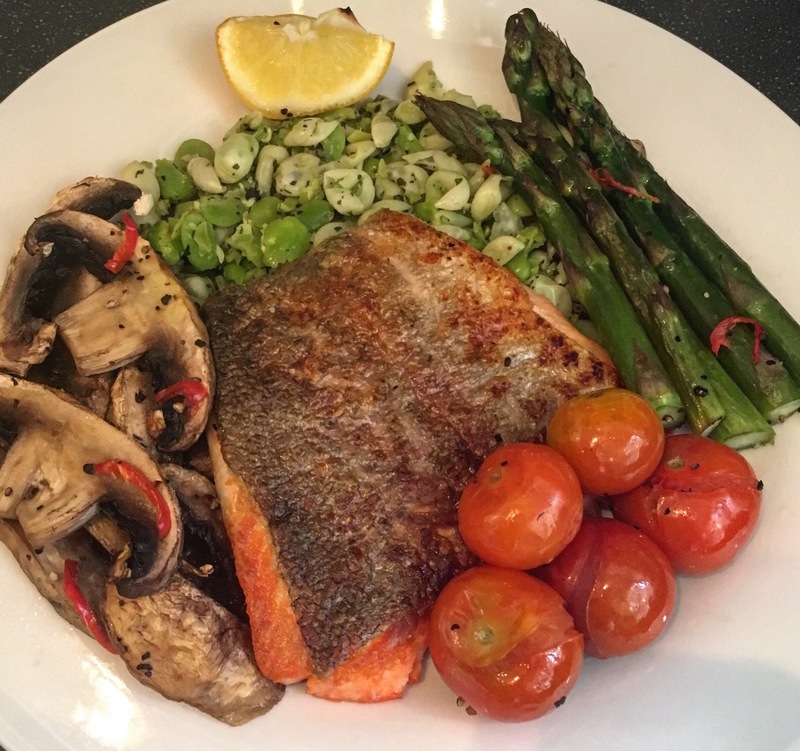 In an attempt to lift my spirits (which have been throughly crushed by mother nature today) as well as have a healthier evening meal, I decided to make use of the fresh fish counter trout I had in my fridge. 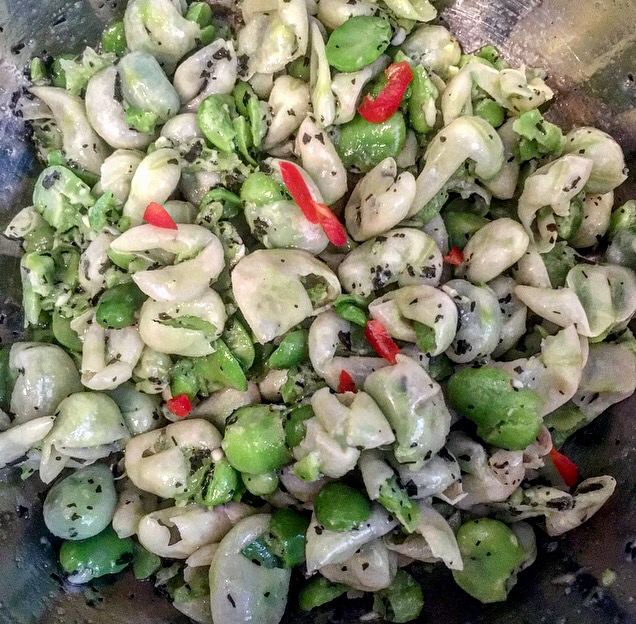 Throwing together some seasonal greens and one of my freezer staples, frozen broad beans, I managed to make a satisfying but healthy dish that is both high in flavour and hunger-busting protein. The lemon gave it a fresh zing and upped the spring factor – winner winner. Once completely thawed, add the beans to a small saucepan with a glug of olive oil and plenty of seasoning as well as some of the lemon juice, chilli and mint. Heat gently for a few minutes until the beans become softer and then mash roughly with a fork. 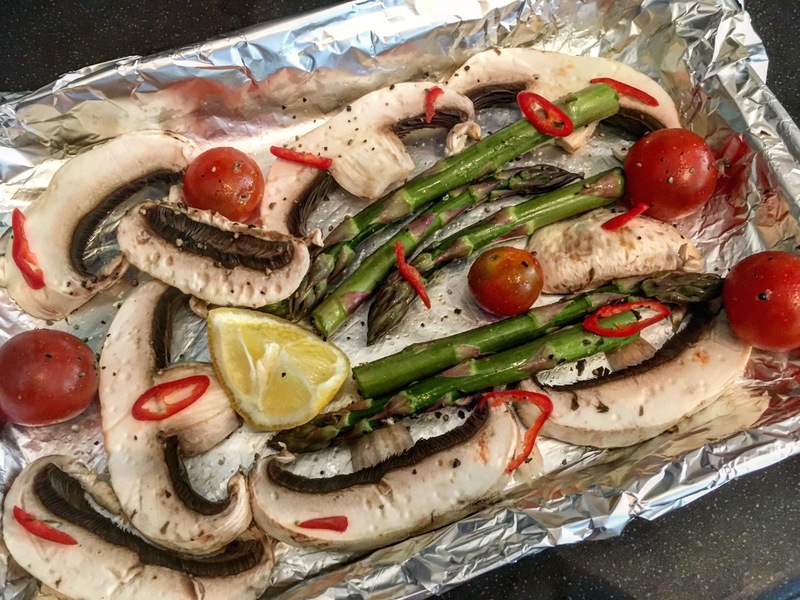 Pre-heat the oven to 180° and drizzle a baking pan (I cover mine with tin foil) with olive oil. Add the asparagus, mushroom and tomatoes and roll around in the oil before adding the seasoning and some of the fresh chilli. Cook for 10 minutes, and chuck in the lemon wedge. 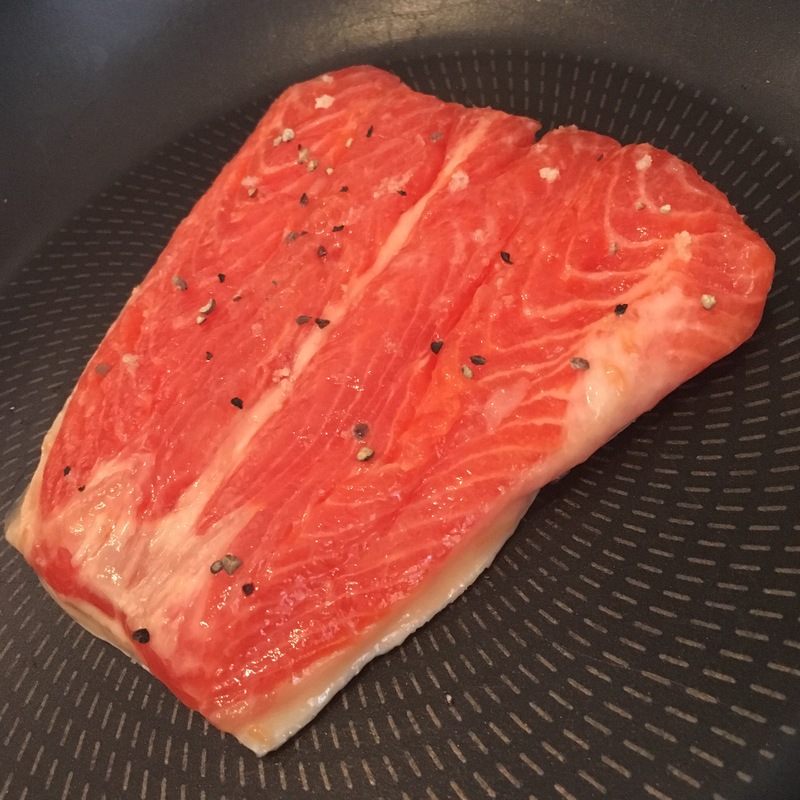 Heat a nonstick pan and put the trout skinside down, seasoning the fish at the same time. Cook for five minutes or until the flesh is light pink and tender to the touch. Make a bed with the minted broad beans, then place your panfried fish and oven roasted vegetables alongside. Squeeze the baked lemon wedge over the fish – delicious.